What Do Employee Incentives Consist of at Work? What Are Employee Incentives at Work? An incentive is an object, item of value or desired action or event that spurs an employee to do more of whatever was encouraged by the employer through the chosen incentive. You want to manage your incentives in such a way that you do not create entitled employees. You also do not want to demotivate employees. Employee incentives can play a significant role in retaining the employees you most want to keep. They also play a huge role in attracting employees to join your organization. Four kinds of incentives are available for employers to use at work. Others might categorize these incentives differently, but these four categories work for most situations. Compensation incentives may include items such as raises, bonuses, profit sharing, signing bonus, and stock options. 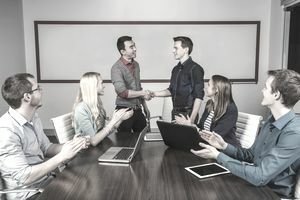 Recognition incentives include actions such as thanking employees, praising employees, presenting employees with a certificate of achievement, or announcing an accomplishment at a company meeting. Employers can offer recognition incentives as part of an overall company employee recognition program. They can also offer employee recognition in the day-to-day interaction of managers with employees. A personal note of praise from the manager is an employee favorite incentive. Appreciation incentives include such happenings as company parties and celebrations, company-paid family activity events, ice cream socials, birthday celebrations, sporting events, paid group lunches, and sponsored sports teams. An example is a product development team that meets the goals of its first phase of a product project and orders in pizza for the team celebration. How Do Employers Use Incentives? Employers use incentives to promote a particular behavior or performance that they believe is necessary for the organization’s success. For example, a software company provides employee lunches on Fridays to promote teamwork across departments and functional areas. The lunches are also an excellent opportunity to brief employees on company progress outside of their assigned areas. They also use the lunches to provide necessary information to employees or for employees to present to their coworkers on hobbies and interests—all of which contribute to staff members knowing each other better. Incentives can be tricky for employers. Depending on what is incentivized, employers can encourage teamwork and cooperation or damage it. If you provide an individual sales incentive for sales staff, for example, you guarantee that your sales force will not work together to make sales. Alternatively, provide a team incentive and employees will follow up each other’s leads, share best methods, and work as a team to make sales. Traditionally, manufacturing companies incentivized productivity or achieving quantity targets. They found that unless they added the quality back into the equation, they were delivering shoddy, poor quality parts—although lots of them were delivered. When you design an incentive program, make sure you are rewarding the actual behaviors that you wish to incentivize. It is so easy to emphasize the wrong behaviors—often unwittingly. Reward and recognition activities that are transparent work to build trust with employees. If criteria or the recognition process are secret, if they appear to only recognize pet employees, or if they are arbitrary, you risk alienating and demoralizing employees. Make sure that all employees understand the objectives the employer has in offering incentives. Ensure that the criteria for obtaining the incentives are clearly spelled out. State the timeline and allow a certain amount of time for employees to accomplish the actions that you'd like to see when you communicate the incentives criteria. Reward every employee who achieves the expectations. Tell the employees exactly why their contribution made them eligible to receive the incentive. You can magnify the power of the incentives you provide by writing a letter to the employee that provides thanks to him or her for their contribution. You can also announce all of the recipients of the incentive at a company meeting and personally thank each recipient. In addition to company programs or incentive processes, managers have the opportunity every day to provide incentives for employees. A simple thank you, even asking the employee how they spent their weekend to indicate care and interest, doesn't cost anything and goes a long way in helping employees experience positive workplace morale. Gifts that are provided for specific achievements such as releasing a product or making a large sale should be random and frequent. You want to create an environment in which employees feel that recognition and incentives are available for good work and that they are not a scarce resource. You also want to avoid doing the same thing every time because those incentives eventually become entitlements. Once they are entitlements, they lose their power to recognize employees or to communicate and reinforce the behaviors the employer wishes to encourage. Incentives can help employers reinforce with employees the kinds of actions and contributions that will help the organization succeed. Used effectively, incentives help build employee motivation and engagement. Employees want to be part of something that is bigger than themselves. Employers need to use more incentives to help build employee morale and to ensure that employees feel appreciated for their contributions. Distributed appropriately, in a transparent manner that employees understand, you can't go wrong with incentives to praise and thank employees for their performance and contributions. Incentives provide a powerful, affirming recognition. Do more of it to foster your organization's success.